is an independent Sound Design company based out of Toronto, Ontario, Canada. CaBooM specializes in Dialogue/ADR, Sound Effects Editing and Sound Design for productions of all genres and formats. Please contact CaBooM if you need superior Sound Editing for your project. Northern Rescue will be coming to CBC in the spring of 2019! Star Falls will be coming to YTV soon! It will air on Nickelodeon this spring. Workin' Moms is airing on CBC! Check it out. Schitt's Creek Season will be airing on CBC starting in January! CaBooM has Co-Produced a short documentary entitled Little Questions! Check out the synopsis on the Production tab. 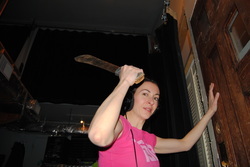 Doing Foley for "The Basement"
No chickens were harmed in the foleying of this movie. It's amazing what a raw chicken, some watermelon and a wet cloth will do for a gruesome murder scene. Watch out I have a machete!